Here’s some health news about an herbal cure called “silymarin” that can help in the fight against disease-causing toxins. These toxins usually enter the body through the air we breathe and the water we drink. They seem to be an inevitable part of our lives and are just about impossible to avoid. The problem with a particular class of toxins—those found in heavy metals—is that they trigger a very harmful chain-reaction inside your body. When metals reach toxic levels, oxidative stress is the result. Oxidative stress damages your cells, and this, in turn, could lead to serious health problems. One particular metal that has been linked to a toxic build-up in the kidneys is manganese. Manganese is perfectly safe and necessary in the right amounts. But too much manganese has been linked to neurological disorders. 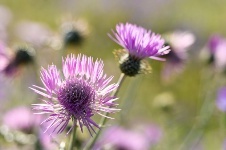 In a recent study, researchers found that silymarin, or milk thistle as it’s commonly known, can help reduce a toxic build-up of manganese in the kidneys. Silymarin is a natural flavonoid, and it has been reported to have many benefits and medicinal properties. The researchers tested it on rats that had experienced kidney damage due to manganese toxicity. Silymarin is an herbal cure you could try if you’re experience health problems due to a toxic overload of heavy metals. It’s currently being investigated as a treatment to help remedy liver damage caused by cancer treatments. Chtourou, Y., et al., “Protective role of silymarin against manganese-induced nephrotoxicity and oxidative stress in rat,” Environ Toxicol. January 22, 2013.